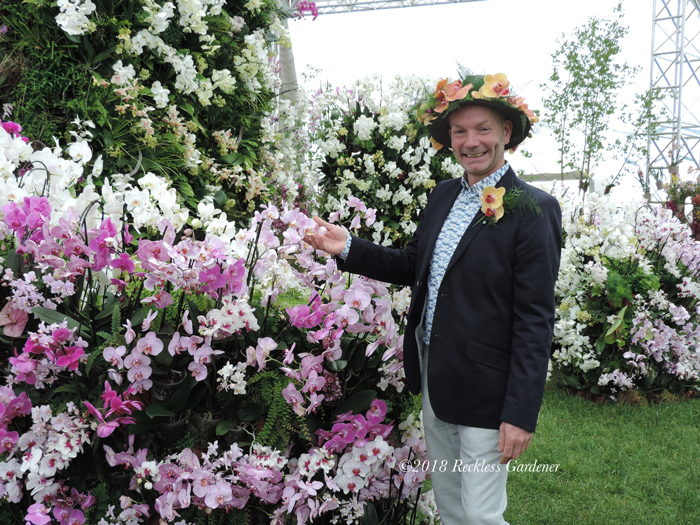 Sandy Felton takes a look at the 2018 RHS Chatsworth Flower Show and enjoys a feast of flowers, impressive exhibits, installations and some pretty amazing orchids. Photographs by Emma J Campbell Photography. 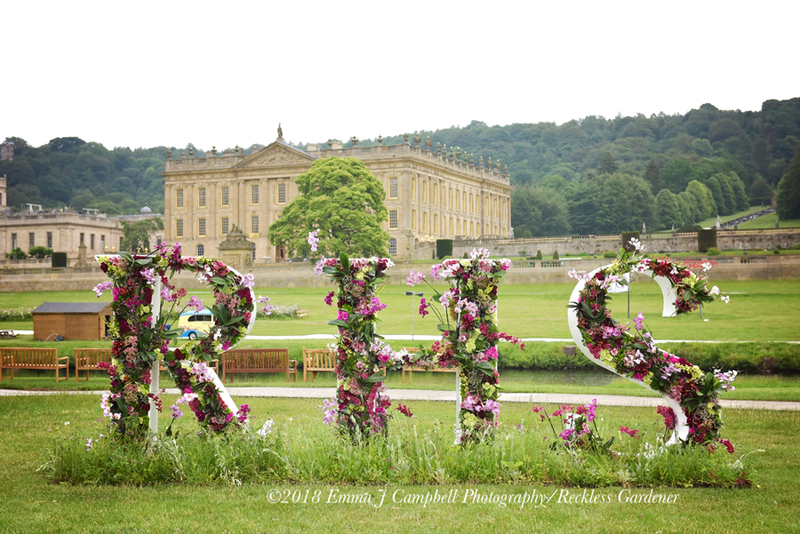 What I like about RHS Chatsworth is its special character – yes, I know every flower show has a special character but RHS Chatsworth in its second year is definitely cementing a special place in the gardening calendar both through its location and the diversity of its exhibits. It’s where gardening and art meet and much more besides. 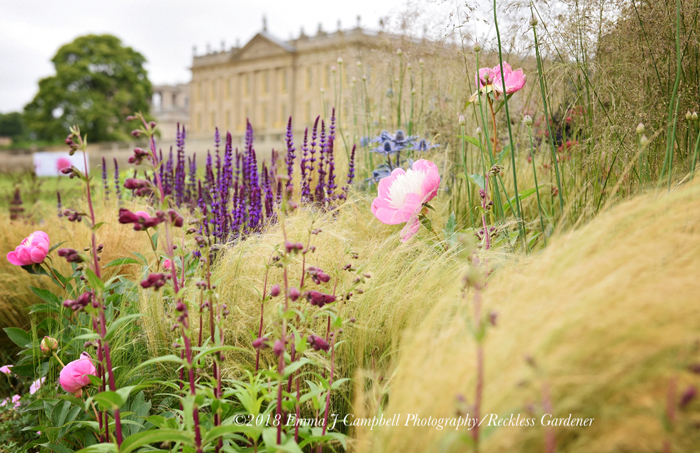 With a feast of flowers, installations forming a freedom of expression through sculptural design, show gardens and borders, RHS Chatsworth provides an interesting and informative visit in the most beautiful surroundings. So here is a run-down of what we liked, the installations we found interesting and the amazing Great Conservatory orchid display, which basically takes your breath away. 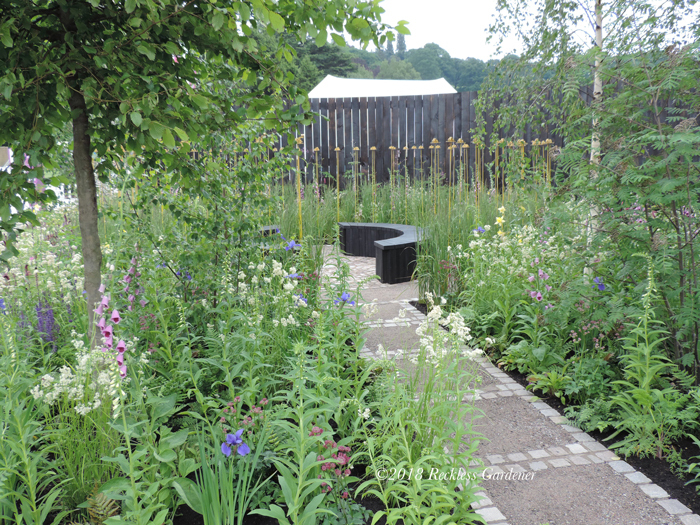 Of the five judged show gardens Gold and Best in Show went to ‘The Great Outdoors‘ (above) designed by Phil Hirst. 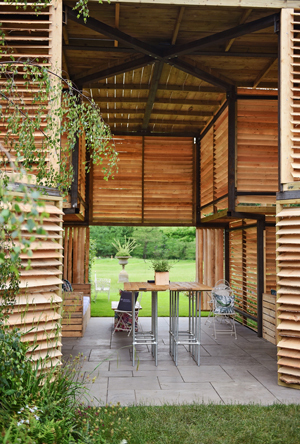 This is a lovely relaxed space celebrating the natural, local environment, evoking the beauty of woodland and moorland through the structures and planting. Definitely a relaxing space and one of our favourite gardens. 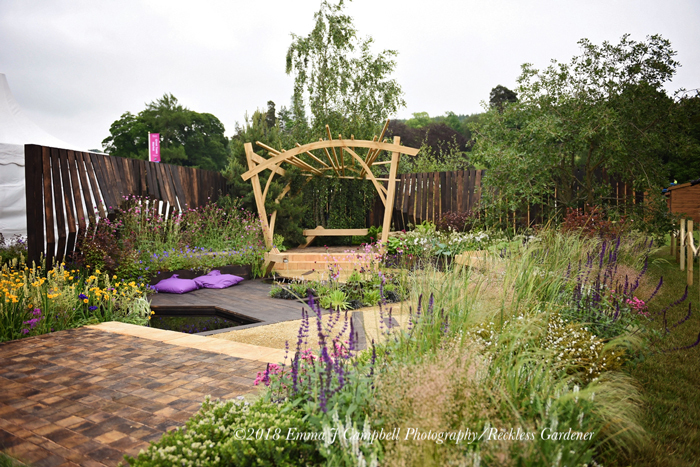 A spokesman for the RHS Judging Panel commented that the garden was exactly true to the brief in that the designer made a beautiful domestic garden in a variety of materials on a limited budget. We couldn’t agree more. 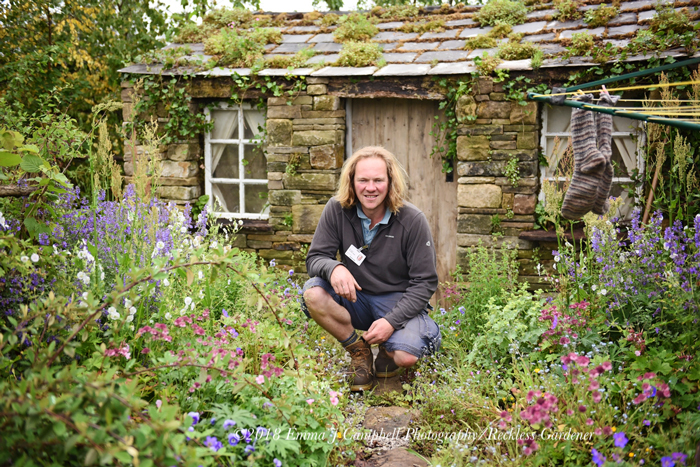 I loved Chris Myers ‘Hay Time in the Dales‘ (Chris pictured above in the garden) and thought this was a terrific garden definitely deserving of, in my opinion, more than a Silver medal. Chris has brought the Yorkshire Dales right into Chatsworth and I am sure this garden is going to be one of the firm favourites with show visitors. The little cottage is just perfect and the whole garden will be familiar to anyone who has spent time in the Yorkshire Dales or has lived there. However, there is an important message behind this garden and the species rich meadow planting next to the cottage is the key – the garden highlights the loss of our hay meadows. Over the past 50 years, 97% of our hay meadows has been lost and sponsor Yorkshire Dales Millennium Trust (YDMT) hope the garden to raises awareness of their Hay Time Appeal to get people to re-establish meadows like this. Celebrating 100 years of tractors, John Deere (Silver-Gilt) (above) designed by Elspeth Stockwell and Jo Fairfax, was another garden I liked. A circular seating area within a meadow-like setting provided a relaxed and comfortable space. The garden was combined with John Deere’s trade stand and they perfectly complemented each other. Particularly interesting was the early tractor they brought along as part of the display. 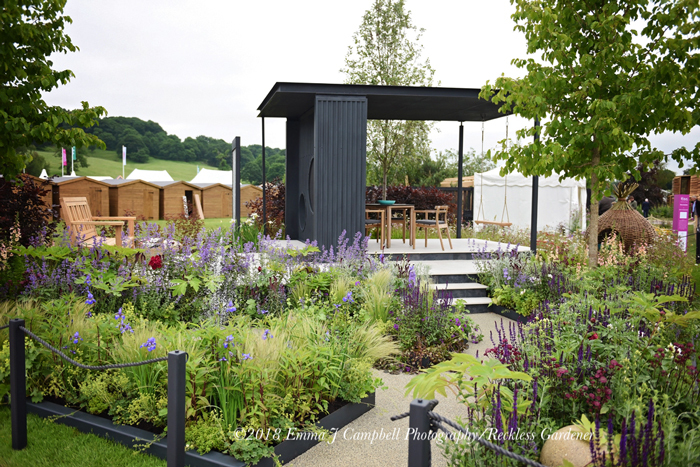 Silver-Gilt also went to the ‘CCLA: A Family Garden‘ designed by Amanda Waring and Laura Arison. Another lovely space with a delightful pavilion and lovely planting. Plenty of ideas here for an all-inclusive safe children’s play area that can be shared with all the family. The Macmillian Cancer Support Legacy Garden (Silver-Gilt) designed by Michael Coley takes its idea that from one seed you can grow an entire garden. (left) The circular design incorporated large blocks of Derbyshire fossil limestone – from the Quarry at Chatsworth – having a rather cooling effect on a hot day. What is really special about RHS Chatsworth is the random installations dotted around the site and the two favourites for us were The Brewin Dolphin Installation designed by Paul Hervey-Brookes and the Wedgwood Chatsworth Installation – Emergence designed by craftsman Carl Hardman, supported by Chatsworth Head of Gardens and Landscape, Steve Porter. The Brewin Dolphin Installation is inspired by a past landscape of the Chatsworth Estate echoing a lost village that once stood in the shadow of the great house before being removed by ‘Capability’ Brown. At the centre of the garden is a contemporary wooden building made of slats that you can see through and I actually found this rather moving. Planting references the indigenous landscape and combines native plants with decorative cultivars. There is a lot to see on this garden and a lot to assimilate on the planting. Herb expert Jekka McVicar has grown eight specialist varieties of medicinal plants and food crops that would have been grown when the foundations of Chatsworth House were laid. An unusual and interesting exhibit and you could spend hours plant hunting – native plants that would have been common at the time are interspersed with decorative varieties that would have been introduced in later years. Look for the Wild Angelica (used as a vegetable until 20th century), Sanguisorba and Tanacetum (sometimes known as Bachelor’s Button or Feverfew, which is still used to treat migranes today). ‘Emergence‘ (above) celebrates the shared history Wedgwood and Chatsworth have dating back to the 18th century. As the main sponsors of the RHS Chatsworth Flower Show 2018, Wedgwood wanted to further collaborate with Chatsworth and has worked with Carl and Steve to create the installation using stone quarried on the site from Chatsworth. 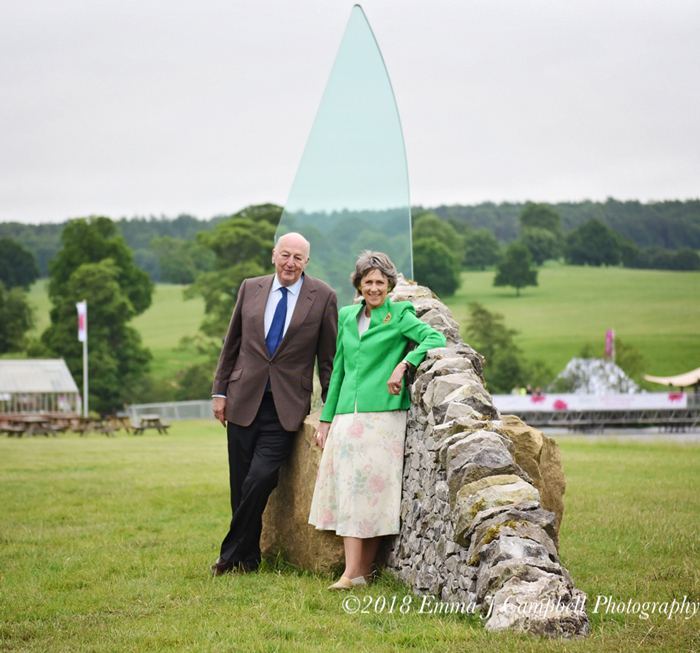 (Above: The Duke and Duchess of Devonshire at ‘Emergence’). The wall is really inspirational and depicts the geology of Derbyshire by using limestone for one half of the installation and gritstone for the other with a glass panel, produced at the limits of today’s technology, separating the two. 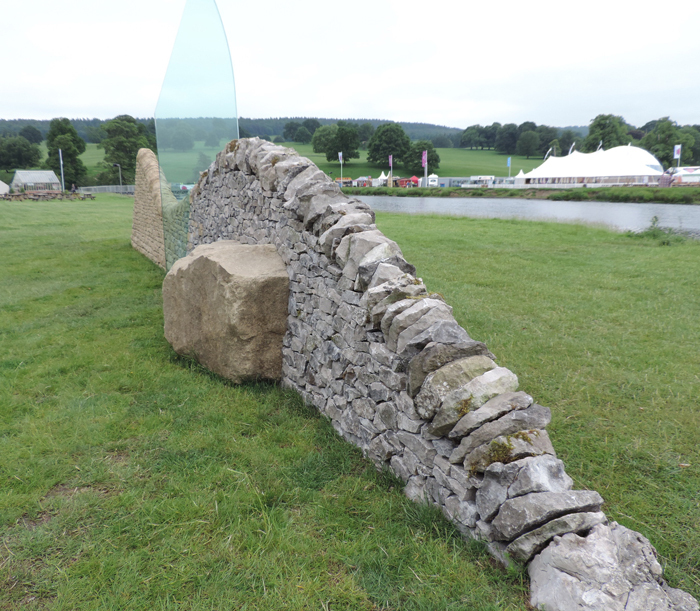 It forms a brilliant tribute to the art of dry stone walling. As with Jo Thompson’s exhibit on this spot last year, I just want Emergence to stay there it sits so well in the landscape. The Long Border category is going to prove very popular with visitors at the Show with plenty of planting ideas we can all follow. Best Long Border and Gold went to Louisa van den Berg for ‘Mind the Gap: Keep Bees on the Move’. In the Floral Marquee, ‘Every Picture Tells a Story‘ won Best Exhibit (Gold) for their Bromeliads and associated plants. RHS Master Grower was D’Arcy & Everest. 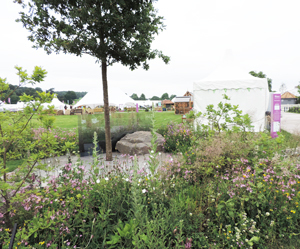 There is so much to do around the show – visit the RHS Living Laboratory to journey through the experimental urban landscape, watch the artisan crafts where you can see dry stone walling, woven wicker work and traditional woodland crafts, stand and stare at the colourful cosmos display where 12,000 Cosmos bipinnatus ‘Razzmatazz’ make quite a splash, or visit the special garden feature, The RHS & BBC Gardeners’ Question Time Bloomin’ Healthy Garden. Saving the best to last, the 5,000 orchid display of Phalaenopsis plants in The Great Conservatory is just amazing. This is certainly the wow factor this year and a really beautiful exhibit. 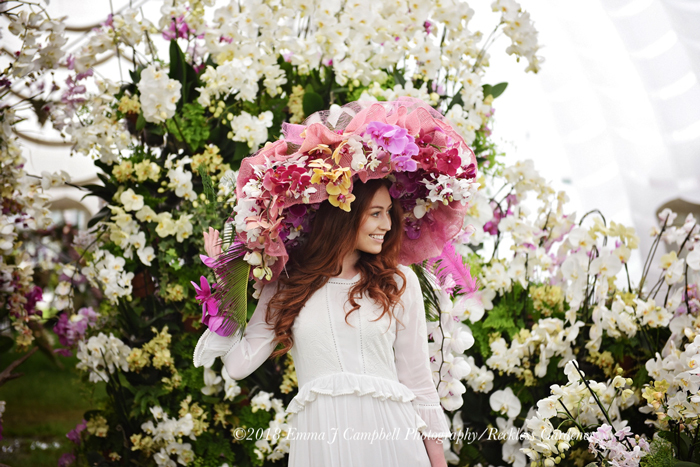 Masterminded by floral designer Jonathan Moseley, this flamboyant and colourful display is breathtaking. More than 100 cultivars are used in all sorts of imaginative ways – they are suspended from the ceiling, displayed among chandeliers, built around a waterfall. Jonathan teamed up with Double H Nurseries to create the display and visitors are going to be enthralled when they see it. Absolutely stunning. There is one thing for sure and that is we came away with lots of ideas having enjoyed a brilliant show.